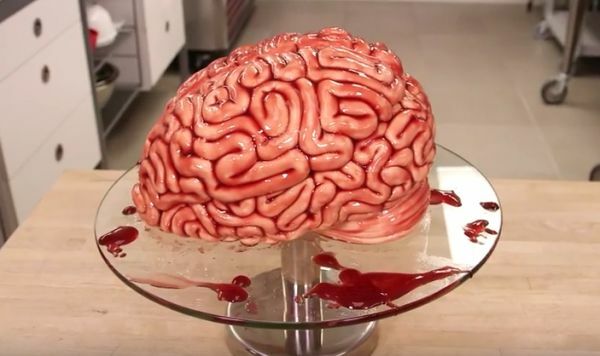 This would be the perfect cake for a Halloween party (the “bloody” syrup coating is a nice touch). Apparently this was done in honor of The Walking Dead (which I admittedly stopped watching a couple seasons ago because I started getting bored with it…zombies are very overdone these days so it takes a lot to keep my attention). I’d love to try my hand at this cake. Watch the tutorial video! This entry was posted on October 7, 2015 at 6:55 pm and is filed under anatomy, cake, food, halloween, inspiration, macabre with tags anatomy, cake, food, halloween, inspiration, macabre. You can follow any responses to this entry through the RSS 2.0 feed. You can leave a response, or trackback from your own site. That’s really great! I’ve never seen one of these things getting made before and it was a really great video even though it was frequently unsettling from the brain carving to the brain gobbling. Could you ever eat that though? Ew. My love of cake trumps any grotesque cake shape. I could eat it.